If a picture is worth a thousand words, maybe a trace paper sketch is worth a few hundred… So instead of writing much this week, I’m going to use this blog to share some photos of my process and progress on the garden project. Plus, you’ll get to see how I’ve been turning everything from Joanne’s upstairs room to Tim and Brittany’s kitchen into my “office space” for the time! Concept 3 (hopefully final) in progress now! The good news is I’m getting close to something that looks like an actual plan…actually I have about three concepts like that. The other news is that it’s bound to keep changing slightly up until the last minute, so don’t take any of this as absolute! I usually start each concept at a very small scale to get the basic forms and relationships down and not to get distracted by details. Then I go bigger and free sketch it, roughly measuring forms. Finally, I develop that into a measured, hard-lined plan (still on trace), trying different details and iterations as I develop this stage. When drawing a plan, it can be difficult to figure out the order in which to do it. Everything hinges on something else, and so it’s important to have a few “constants” while working. What can’t move? What is flexible? What is easiest to change, or should result in two alternatives? I deal with these questions a lot. Lastly, I loved being at the farm breakfast on Sunday! The food was delicious and the company was fun and interesting, but I especially enjoyed experiencing the garden space in a totally new way – in that social way that everyone loves it for – that brought it even more to life. Thanks to everyone who helped put it together! I spent most of last week reading about probably 30 community gardens, and used just as many feet of trace paper making plans over diagrams over maps of the current garden space at Tryon. Days of going through this routine confirmed to me how seemingly endless the design process can feel, but not in a negative sense. The endless possibilities for a design are exciting: the confusing and sometimes stressful part is pursuing which are best, which ideas should not forever stay as ideas, but be pushed into becoming the new reality of a place. To do this, I test the “worthiness” of different plans against the constraints of the site and its context – for example, will the placement of a garden bed get enough sunlight? – and also against themselves – does it really make sense that I planned the storage area to be 100 feet from the garden? (No, no it doesn’t). But, designing the garden is clearly about more than just programming what function will happen where. For me, the most helpful exercise has been going out to the garden every day to physically “walk through” each new plan I come up with, to see how the experience of being in this reimagined place feels. Most importantly, this has helped me to mentally diminish the dominance of what is there, and instead to primarily see what could, and even should, be there. I’ve been so pleased to hear people in this community confess to me that they do the same thing. I think this proves that we do want change, we do want this place to be more beautiful and more efficient, even if it sometimes feels foolish or fruitless to imagine something far from present reality. Thankfully, that’s a part of my job! . . . . . . . . . . . . . . . . Early diagrams & a slide from Saturday’s presentation . . . . . . . . . . . . . . . . Thank you to everyone who has joined in this process so far, from filling out the survey to listening to my ideas last Saturday. The positive responses were very encouraging! First, I hope everyone had a fun and relaxing Fourth of July! Second, excuse me for not posting last week (for those keeping count). I’m having trouble crafting a “theme” or “topic” for this week’s blog, because I feel my work the past two weeks has similarly lacked one unifying goal or subject. …But they’re all part of the nonlinear and somewhat unpredictable path of design (of most work, really), and of having goals and visions slowly come to life. Spending an hour on diagrams that don’t look great and won’t be shown to anyone is sometimes frustrating, but it’s a valuable task nonetheless, a part of my understanding of a space and the issues and opportunities it presents. These unexpected encounters and discoveries happily helped me understand the community here and imagine how the garden could be in the future! The vegetable garden is clearly one of the most successful public and social spaces at Tryon Farm: just from casual conversations so far, I can tell that the social function of this space is what people value the most about it, even more so than its produce! However, I know that this space has the potential to be more beautiful, productive, and supportive of community – in fact, this is my aim for the next five weeks – and that all hinges on good design. William Whyte :: Social elements of space :: Whyte was an urbanist and journalist, and loved to meticulously observe people’s habits to understand what made social spaces successful. He produced a fascinating documentary called “The Social Life of Small Urban Spaces.” I highly recommend, if only for his entertaining narration and footage of past fashion trends. Kevin Lynch :: Perception of space :: Lynch was an urban planner made famous for his work on how people mentally perceive and categorize space. He broke down these categorizations into the elements of paths, edges, districts, nodes, and landmarks. I especially use his ideas when making maps, like the one I just finished for TFI! Francis Ching :: Ordering of space :: Ching draws and writes on all things architecture, and his ordering principles are the keys to survival for every Ball State first-year design student. They include axis, symmetry, hierarchy, rhythm, datum, and transformation, and I once spent three weeks straight slicing up pieces of black and white paper in patterns that followed these principles. What are your thoughts? What other places on the Farm might benefit from some “design thinking” such as this? I put Tryon Farm work on hold this week to help delineate a wetland in a very unexpected place. Driving up to Orak Shrine on Franklin, I never would have guessed I was approaching the site. At first sight, all I noticed was a wooded area mainly filled with dead Ash trees. But I followed Sarah into those woods anyways, and discovered a thriving and diverse wetland. Here were a community of beautiful sedges and other wetland plants, frogs, crayfish, fawns, and birds. This unassuming, undeveloped piece of land along the city’s main commercial strip was full of life just living for its own sake. Nature like this is everywhere: it’s not officially preserved or recreationally used, we’re not aware of and not drawn to it, but it exists nonetheless. How to make a path from one end to the other while dodging the raspberry thorns and poison ivy – even though there’s no way to escape it all. How to tell which way is North or West or East based on where the Sun is making leaves glow the brightest. I also learned how hard it is to be certain in this work of defining a landscape meter by meter when everything is so interconnected and fluid – upland and wetland plants live within the same square foot, and can I really tell if the rust color in the soil makes up 2% or 5% of the sample? Regardless of where the line is drawn in the end, this landscape and natural community is what it is. To me, that’s comforting in the realm of physical reality (even if it’s frustrating in legal reality). And, regardless of where the line is drawn in the end, it is a line that ensures the right of this place to keep existing. That right is something I am certain of. Nearly every day this week, I’ve walked around the beautiful landscapes of Tryon Farm for an hour or two and it’s counted as part of my “workday” (don’t worry, that’s not all I’ve done). I’m doing this not only to familiarize myself with the Farm and enjoy the early days of summer, but as a part of the process for my first assignment: I am to add to the litany of Tryon Farm maps one that focuses on the diverse landscapes managed by the Institute. In the process of experiencing this place in order to map it, I have to say I feel a little overwhelmed. Not because of the Farm’s size, but because of its intricacies. How can I capture the details of this place in a map? Or should a map even try to do this? A map can use lines to indicate parcels, paths, and pond edges. However, I don’t believe it can fully express the complexity of plant communities or the morning light on a meadow. But hopefully, it can make you want to go and experience a place for yourself, and maybe even suggest how best to do that. That is what I’ve chosen to aim for with this design. Now for the practical part of this blog: I’ve been using an app called LiveTrekker while on my walks. It traces my steps onto a satellite image, and as I’m walking I can pause to add a photo, video, sound recording, or note that will attach itself to the point on the path at which I took it. It’s been incredibly helpful not only for getting accurate locations of trails, but for marking things I found memorable, important, or simply beautiful. All of your “Treks” are accessible on computer and, most importantly, shareable. I encourage everyone to get this app, and we can use it at Tryon Farm to share our personal observations of things that are fleeting and not normally expressed on a map: the location of a bird’s nest, flooded points on the trail, or where new wildflowers are in bloom. I think it would be a wonderful way to build community around the natural communities here at Tryon! Let me know what you think. Today we welcome Maggie Weighner to Tryon Farm to begin her summer internship with the Institute! Maggie is in Year 5 (of 5) of her Professional degree program in Landscape Architecture at Ball State University in Muncie, Indiana. She will be spending the 2017 summer residing at a rotating set of Tryon Farm homes donated by our Members, experiencing the variety of landscapes and living environments at the Farm. Beginning on Friday, she’ll be posting blog updates about her experiences with the internship and at the Farm. to Maggie for contributing her talents and interest to our humble Farm project! 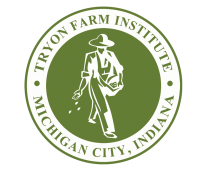 Tryon Farm Institute, Inc. (TFI) is an Indiana chartered non-profit land trust and education organization with a mission to connect human and natural communities by promoting habitat diversity and sustainable land husbandry.